Satin dress and shoes, ALEXANDER MCQUEEN. Necklace, RITA TESOLIN. Bracelet, Dolce & Gabbana. 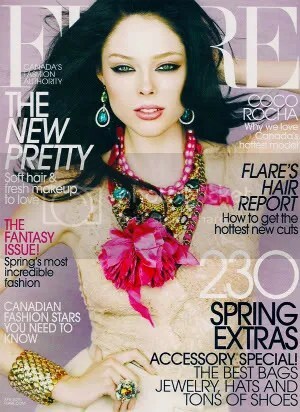 Coco Rocha is stunning in this fun-loving cover shoot full of hearts and pastels. My favorite look from this shoot is the denim Dolce & Gabbana top, skirt, and black booties in the last image. I am just a sucker for lace! Tulle dress, FENDI. Earrings, BEN-AMUN BY ISAAC MANEVITZ. Ring, R.J. GRAZIANO. Necklace, DANIEL ESPINOSA JEWELRY. Looking scorchingly stunning in the desert, Karmen Pedaru is fully adorned with feathers and bright colors looking very tribal yet summery. From skeleton tights and metal rib cage tops to furs and sequins, Abbey Lee never ceases to produce an amazing editorial in pieces by Burberry Prorsum, Piers Atkinson, Katie Eary, Merchant Archive, Eddie Borgo, and Jennifer Behr. My favorite piece in this editorial is the gold metal Katie Eary rib cage top. Showing off her slender, post-baby body, Gisele Bundchen is on the cover of the April 2010 issue of Vogue US. In the cover shoot, she shows off her baby bump as well as her new-born baby boy. Her post-baby body doesn’t even show any sign of a recent pregnancy! In an interview for the magazine, she talks about naming her son, staying in shape during her pregnancy, and reveals the challenges of mentoring young women of color in urban Boston. In bright and colorful designs by Alexander McQueen, Versace, and Prada, Aussie Abbey Lee looks flawless in dynamic poses. She is definitely one of my favorites this year.